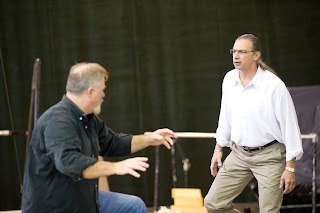 At last night's rehearsal I got a chance to check in with Greer Grimsley, Seattle's favorite father of the gods, villainous Roman police chief, long-haired Vespa rider, superstar bass-baritone, and all-around great guy. Left, Greer last summer as Wotan bids a tearful farewell to his daughter, Janice Baird as Brünnhilde (Chris Bennion, photo). Welcome back to Seattle, and welcome back to Kurwenal! What’s it like to return to this role in this city, twelve years later? You’ve sung a lot of Wagner for us since then. First of all, it’s always great to be here, I love Seattle. As for Kurwenal, yes, twelve years! During that time I’ve done it at the Met, in Denmark, and in Berlin...but it’s been a few years now since I’ve done the role, and I find I’m bringing more facets to the character, detailing it more specifically, musically, than I did in the past. Last summer you sang Wotan here, probably the longest part ever written for male voice. Wagner doesn’t give you anywhere near as much to sing as Kurwenal. That must make for an easier summer. As Kurwenal you sing in Act One and Act Three, and you only have one line in Act Two. But that’s not to say it’s easy--it’s a tricky part, to do it well you have to know what you’re doing. Compared to Wotan, sure, I have a little more free time, but it’s still a lot of work. Not just to sing it, you know, to act it fully...to make the character live to its truest form. 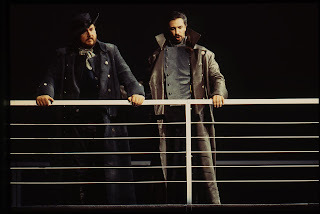 Grimsley was Ben Heppner's Kurwenal in Seattle Opera's 1998 Tristan und Isolde. Why is Kurwenal so devoted to Tristan? Good question, and there are lots of ways of spinning it; you know, there are many conflicting versions of the old Tristan legends. The one I like to land on has it that Kurwenal is Tristan’s mentor, Kurwenal is the one who has taught him how to be the great knight that he is. So I’m devoted to Tristan as a parent to a child, I’ve taken great pride in passing on my knowledge to Tristan. You know, in that version of the story, when Tristan was wounded so terribly before, to show what a loyal friend Kurwenal was to Tristan, Kurwenal was the only one who was willing to dress Tristan’s wound--it was so fetid, it stank, nobody else wanted to go near it. In terms of their ages, we’re playing it that there’s not such a disparity in age between them. So Kurwenal is a little bit like a big brother to Tristan. Clifton Forbis and Greer Grimsley in rehearsal for Tristan und Isolde (Rozarii Lynch, photo). Peter Kazaras was Loge to your Wotan in 2005; now he’s your stage director. Does that change the relationship between the two of you dramatically, or is it more of an incremental thing? The number one thing is that Peter is a dear friend. He’s also fiercely intelligent, and I trust him. That makes for a great working relationship. 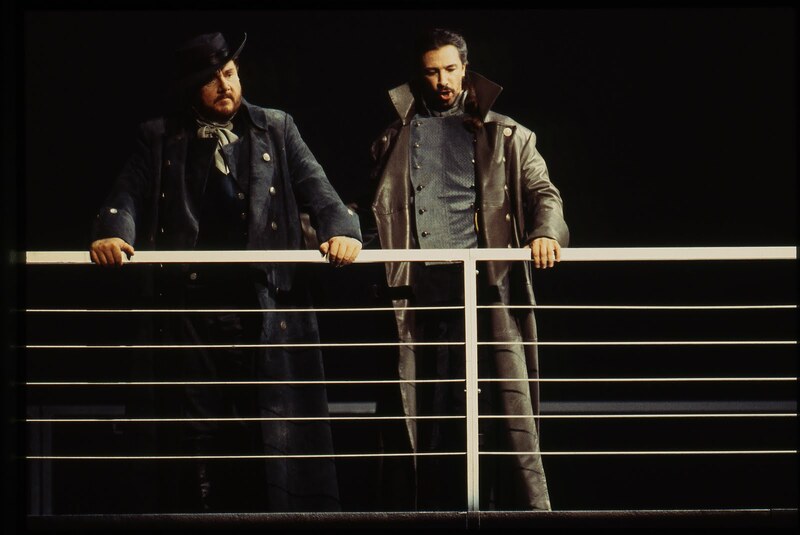 Peter Kazaras as Loge looks down on Greer Grimsley's Wotan in Seattle Opera's 2005 Das Rheingold (Bill Mohn, photo). What’s the vocal challenge of singing Kurwenal? The range Wagner throws Kurwenal is amazing. You go from low A to high G; it’s about the same range as Wotan. 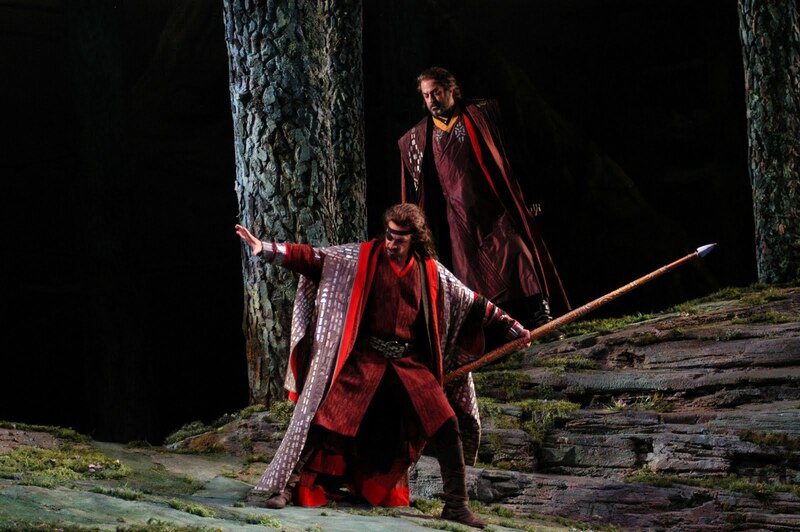 Only Wotan never gets as excited as Kurwenal does! The setting of the high notes is so bombastic, for example when Kurwenal goes “Heia heia ja ha!” [demonstrates Kurwenal’s excited yelp upon sighting Isolde’s ship in Act 3], it can be hard to keep the legato in the part. You’ve sung Wagner with Margaret Jane Wray, Stephen Milling, and Asher Fisch here in Seattle before. Are you meeting Clifton Forbis and Annalena Persson for the first time? I haven’t worked with Annalena before. I’ve known Cliff for years, I sang Scarpia to his Cavaradossi right here in Seattle for Tosca, in 2001. In fact, I remember it very well, he and I were having breakfast at Minnie’s, down where it used to be at Denny and 1st, that morning in February 2001 when we had the earthquake. Grimsley reprised his role as Scarpia in Seattle Opera's 2008 Tosca, menacing Lisa Daltirus as Tosca. Any fun plans for Seattle-area adventures this summer? Well, I just finished retooling my Vespa, and, yeah, I’m hoping to take it as far around the city as I can! CLICK HERE to read the article about Greer Grimsley from this June's Opera News.